Friday’s release did not only contain the new “glue” functionality. There was also an upgrade of the site to work with the new CSV export functionality over at Quiske. In the app, you can record the data, which is then uploaded to the Quiske portal, where you can make charts of the above-mentioned metrics. Obviously, no heart rate data, because RowP doesn’t support heart rate measurements. Actually, with data fusion, Rowsandall.com offers a solution for this. This is exciting for many reasons. First, it gives Quiske users a way to use their data on rowsandall.com and from there to the Concept2 logbook, Strava, etc. 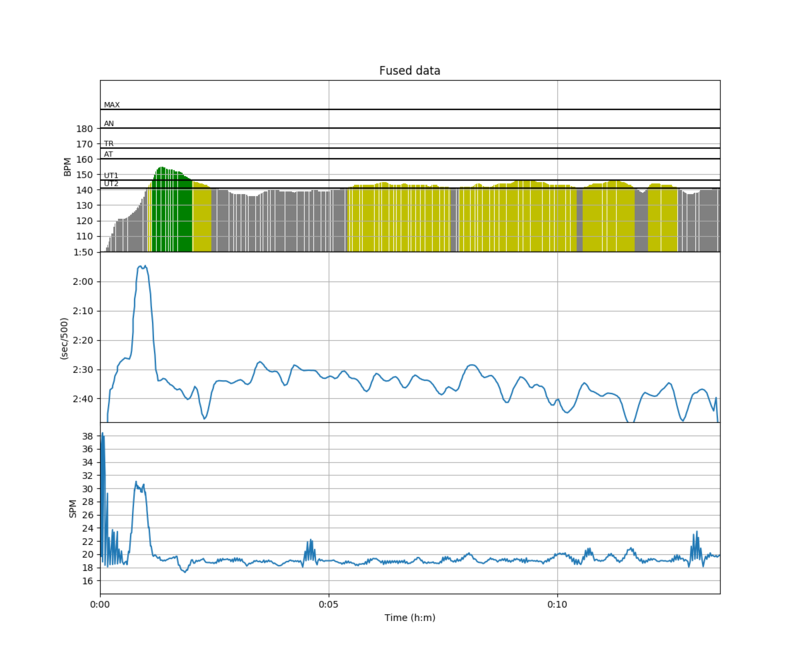 Second, it gives Quiske users a way to systematically track some of the metrics measured by the Quiske pod. 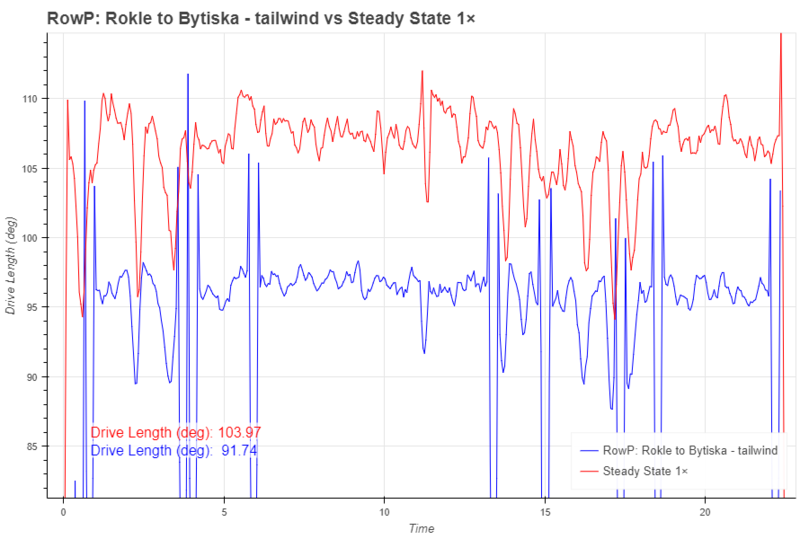 While the Quiske portal is great for looking at the dynamics of the stroke, how you are accelerating and slowing down the boat, and to discover technique flaws like blades flying high before the catch, and/or missing water, at rowsandall.com we can look at per-stroke and per-session data. Currently, we support one new metric for Quiske users: Stroke length (in degrees). You get this metric when you put the sensor on the oar. The CSV file contains a few more metrics, though, and you should see them appear on rowsandall.com in the near future. Obviously, the RowP algorithms are struggling to get the stroke rate right at some points in this row. Was the Empower angle value calibrated well? I do believe so, but trying to recalibrate it this morning, I broke their flimsy 3D printed calibration tool. The Quiske system relies on the RowP app doing some pretty advanced calculations to calculate angles from the acceleration data that the pod is measuring (including feathering). Quiske measures at the oar shaft. Empower measures at the oarlock. I don’t think this is a big thing. They are not the same metrics, and I don’t think that comparing drive length from the two systems is a regular use case. The real use is in tracking the metric and looking at how its values correlate with boat speed and rowing efficiency. 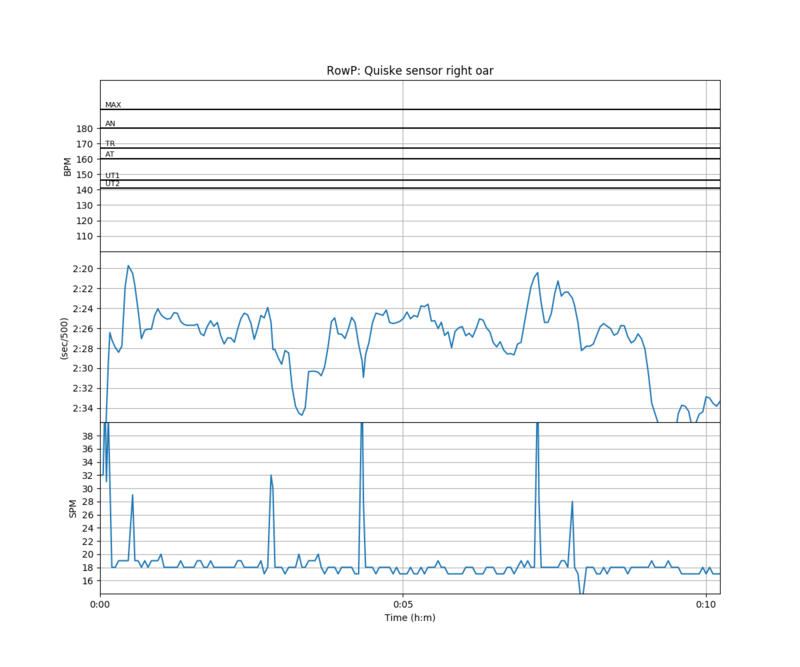 Another interesting way to use rowsandall.com in combination with the Quiske system, is by Data Fusion. If you have CrewNerd, or a CoxMate unit, or an NK SpeedCoach without the Empower Oarlock, you can record in parallel with Quiske and then combine data. 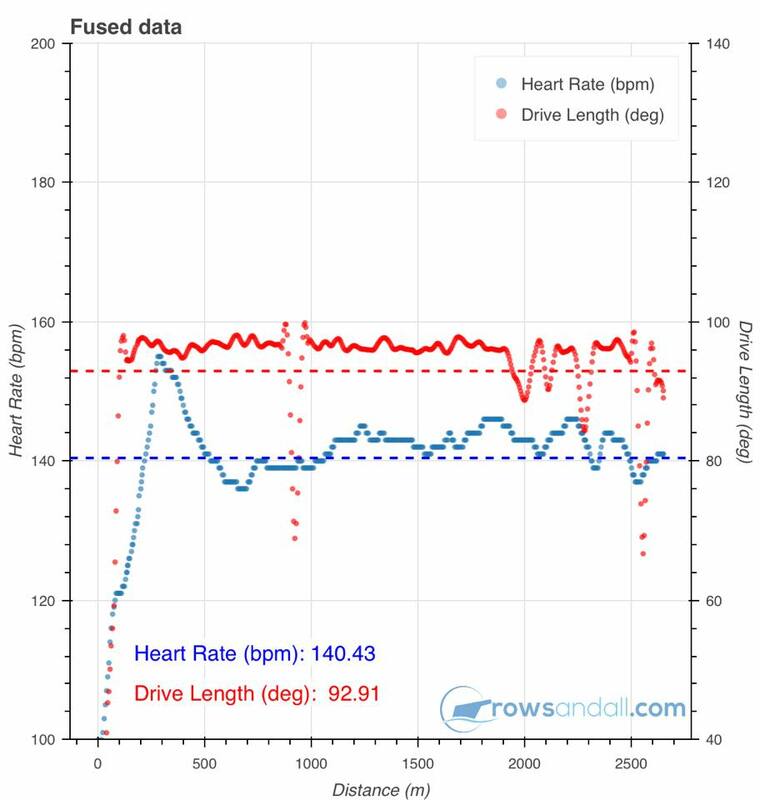 This chart shows heart rate (measured with the NK SpeedCoach and drive length measured with Quiske in one chart. The CSV also contains boat acceleration, seat and oar angle curves. 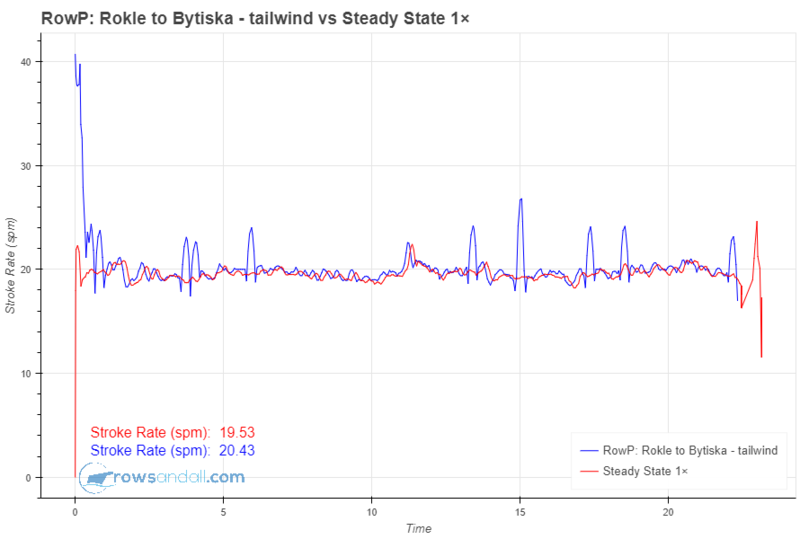 These are in stroke metrics, and visualising them on rowsandall.com requires a bit more work, but the most exciting thing about this is the possibility to derive some per stroke metrics from these curves. These are exciting times for rowing data enthusiasts. Split and glue back together workout pieces. Get separately recorded pieces in one chart.